The later opening of Ore explains why the site became host to structures typical of the SER’s ‘’economical’’ era, which involved erecting new stations as cheaply and quickly as possible. Thus, Ore’s architecture was a far cry from those grand affairs which opened with the Ashford to Hastings route at Winchelsea, Rye, Appledore, and Ham Street, in 1851. The station opened on New Year’s Day 1888: two platforms came into use around a double-track, but these lacked the distinctive staggered arrangement of those earlier-commissioned stations, instead assuming the more conventional positions of residing directly opposite each other. The main 70-foot-long building was erected on the Ashford-bound platform: this was a single-storey clapboard affair, set upon a shallow brick base, and came complete with a slated pitched roof. A pair of chimneystacks emerged through the roof, and attached to the building’s southern elevation was an attractive canopy, which ran the length of the structure. The canopy comprised a semi-circular cross-section and demonstrated the SE&CR’s standard clover-patterned valance – the same design can still be seen in evidence today at Paddock Wood. The ‘’down’’ platform was host to a clapboard waiting shelter, also set upon a shallow brick base, which comprised a downward sloping roof from front to rear, in addition to wrap-a-round sides. From the outset, the platforms were linked at their Hastings ends by a track foot crossing, and trailing crossovers between the running lines were in evidence both east and west of the station. Goods facilities initially consisted of three lengthy eastward-facing sidings situated behind the ‘’up’’ platform, trailing off at about twenty degrees to the running lines. The longest of these extended for about 270 yards, and a row of cattle pens were in evidence immediately north of the sidings. The layout was controlled by a two-storey-high clapboard signal box, positioned alongside the ‘’up’’ line, and located some sixty yards east of the platforms. The cabin was of SER design, complete with sash-style windows, a pyramid-shaped slated pitched roof, and survived the re-signalling of the route to Ashford by contractor Saxby & Farmer in 1893. The SE&CR Joint Managing Committee came into existence in 1899, and during its first ten years of existence, a number if changes occurred at Ore. Interestingly, the platforms became linked at their Ashford ends by a lattice footbridge (a luxury the earlier-opened stations along the route continued to lack), and this in turn connected to a footpath which spurred off from a road to the south of the station. A connection was also made between the ‘’up’’ sidings and an electric power station, and the siding that lay closest to the platforms was re-laid to run parallel with the running lines, albeit at a much reduced length. By the time the Southern Railway took over in 1923, there were no less than six sidings behind the ‘’up’’ platform, in addition to the aforementioned connection with the power station. Furthermore, about 330 yards east of the platforms, a single-track trailing connection was made between the ‘’up’’ line and a local brick works, the latter of which resided on the opposite side of the reservoir to the signal box. A full electric London to Brighton timetable commenced on 1st January 1933, and this was followed two years later by the installation of third rail between Haywards Heath, Eastbourne, and Hastings. 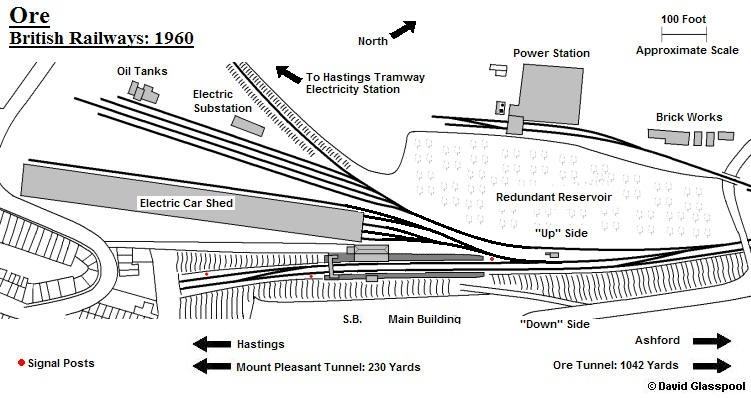 The station at Hastings had previously been rebuilt by the SR in 1931, to provide four platform faces arranged in the form of two islands. Goods facilities at the rebuilt site were spacious, but when the 1935 electrification scheme came around, there was no room to accommodate EMU stabling facilities – neither was it preferable to have empty stock taking up much needed platform capacity. 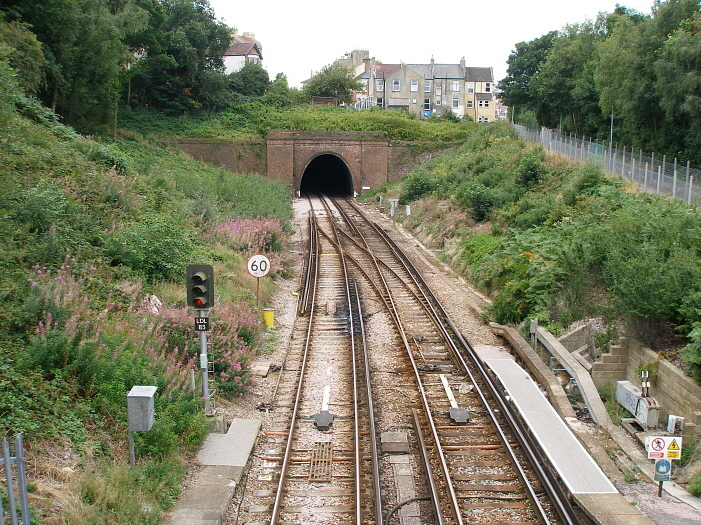 The solution was to extend third rail beyond Hastings, to Ore, where a substantial area existed in-between the ‘’up’’ platform and goods sidings to construct a large EMU maintenance shed. Five electrified eastward-facing sidings were subsequently laid here, four of which were covered within an 800-foot-long shed; the latter comprised a steel frame clad with asbestos. The Brighton to Ore electric timetable formally came into effect on 4th July 1935, and as part of the works, the SR installed a second footbridge, also of lattice construction, at the Hastings ends of the platforms. The latter were partially re-faced with concrete at the same time, and in connection with the electrification programme, the Pullman Car Company commissioned an emergency stores facility at Ore, which held a small amount of food for replenishing terminating 6-PUL electric units. Third rail was taken about 650-yards beyond the platforms, up to the portal of Ore Tunnel, to provide a headshunt facility for electric units using the shed. The shed was used to berth Central Section stock overnight, where it would be cleaned. As part of the electrification, a concrete-encased substation appeared in the goods yard, north of the freight sidings, and this whole area was lined at its perimeter by concrete fencing. Swan neck lampposts and SR ‘’Target’’ name signs had appeared on the surfaces during the previous decade – the latter survived until BR’s ‘’Modern Image’’, escaping being replaced by ‘’Totems’’. The British Railways era is sadly one of considerable decline for this station, and the site has been a prime target for vandals over the years. Goods traffic ceased to be handled here from 1st May 1973, but a selection of non-electrified sidings continued to remain alongside the four track EMU depot and a fifth electrified berthing siding. The SER-designed clapboard signal box was decommissioned on 30th January 1977, control of the area being assumed by the 1931 SR-built cabin at nearby Hastings. About three years earlier, the platforms were re-lined at their rears with wire mesh fencing, supported upon wooden posts, but it was to be the subsequent decade which would yield severe structural cutbacks. These commenced in 1984, when the main ‘’up’’ side building lost its attractive canopy and the ‘’down’’ platform became devoid of its timber-built waiting shelter. The latter was replaced by a soulless rectangular glazed bus shelter affair, but at least the ‘’up’’ side structure was treated to a new coat of paint. In May 1986, Ore carriage shed was formally closed, and the depot’s complement of sixteen drivers and eight guards transferred to St Leonards. This coincided with the electrification of the Hastings via Tunbridge Wells line, and thereafter, the depot became a temporary home to withdrawn ‘’Hastings’’ DEMU formations. As a result of closure, Central Division services no longer terminated at Ore, these being cut back to Hastings. By 1988, the shed had fell into complete disuse, and the derelict building suffered an arson attack; it, nevertheless, remained standing for a number of years longer before demolition. Sadly, in the following decade, the main ‘’up’’ side clapboard station building also suffered an arson attack, resulting in its complete destruction. Once a station of typical SER character, Ore has now been transformed into a barren site, becoming one of the South Eastern Division’s most depressing stations. The subsequent installation of palisade fencing along both platform surfaces and down the entrance walkway makes the site feel more akin to a high security institution, rather than a railway station. The double track narrows immediately before the line plunges into the 230-yard-long Mount Pleasant Tunnel.